I’ve had a lot of people ask for belly photos … so as not to disapoint … we did a few today. Nothing fancy. Nothing prepapred. Just the girls and I on Lyla’s bed. Mid-dance-session (as you can see, they were dancing in their underwear and ballet slippers – with the excption of Lacey, who must wear a tutu She’s six now, you know. No more dancing in underwear – well, most days …). Nothing over the top. Just us. On a hot Friday afternoon. The blob of fur at the bottom of the bed is Daisy, our cockapoo. She can’t be forgotten. She’s one of the girls. And she thinks she’s human. She really does. 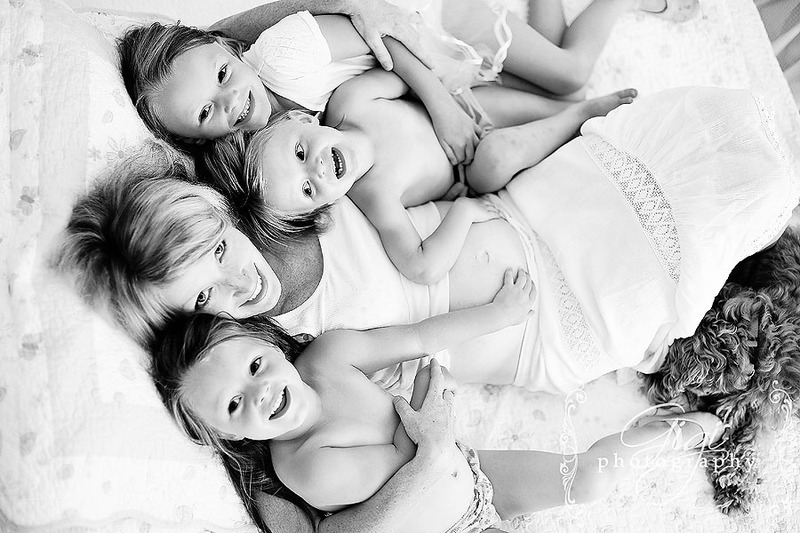 I feel *very* blessed to have my three little girls and one more baby on the way. I never imagined having four children, but I can’t picture it any other way now. And even on days like today (when my patience was being tested with the girls being not-so-angelic from the moment they woke up), I still am grateful. Grateful for the fights. Grateful for the laundry. Grateful for the snuggles. Grateful for the dancing girls. And grateful for one more little baby on the way to cuddle. 26 weeks of love. So thankful. Darlene O’Rourke – Congrats! you are absolutely stunning! Yes..you are truly blessed and always remember..dont sweat the small stuff – someone out there is fighting a battle a lot worse than you or I. Thanks for the POst! michelle – Your photos are so inspiring! I’m also expecting #4 and don’t look nearly as great as you do! Not sure if this was the style you’re looking for but here’s a pair of pink birk’s and the website is Canadian. Happy Shopping! Catherine – *love* these! You are right to remind us all how blessed we are. I love your outlook on life. I’m so glad I know you! Ashley Isaac – You look gorgeous and these pictures are PRICELESS! Julie – Love it! the pics and your words, love it! Margaret LaRocca – Beautiful pictures Gillian, the ones with you and girls….magical and absolutely love the baby bump shot!!! Tabitha – Awwww, your baby bump is adorable 🙂 What a nice afternoon. Teresa – l♥ve the pics. you look beautiful. love the girls hands on your belly. Abby is a great photographer.